In the former period, when business was years. cantly affect the ? nal appraised value. USPAP requirements play a challenging but strong, appraisers could make the case for us- These forms of depreciation - physical, exciting role in the maritime industry. Depreciation ? ow model. In this approach, the future cash At the end of the vessel’s normal economic able” or “incurable.” That is, does it make kay & Strouse, Inc. Harry is a US Navy vet- ? ows of the vessel are evaluated against the life, there is usually some residual value. Be ? nancial sense to do life extension work to eran and has spent much of the past decade risk of obtaining those cash ? ows, and a “net it a secondary use, salvage value, or scrap remove physical depreciation? If so, it’s cur- in the maritime industry in sales, ? nance and present value” is calculated. However, banks value, most vessels do not depreciate 100%. able. Does it make ? nancial sense to repower general management. His goal is to build on in this period were often wary, so risk models To avoid confusion with leasing terminology, or add a DP system to remove technological the strong history and reputation of DLS and were challenging to construct. Lenders know we often refer to this residual value as a “ter- obsolescence? If not, it is incurable deprecia- provide outstanding service to marine indus- how cyclical marine markets can be and it minal value.” Having calculated an annual tion. Economic depreciation, often measured try clients just as the company has done for might be dif? cult to convince a banker that depreciation rate, the appraiser then looks at by the fall in day rates, may not be curable the past 50 years. Under these conditions, where the market set’s value may be signi? 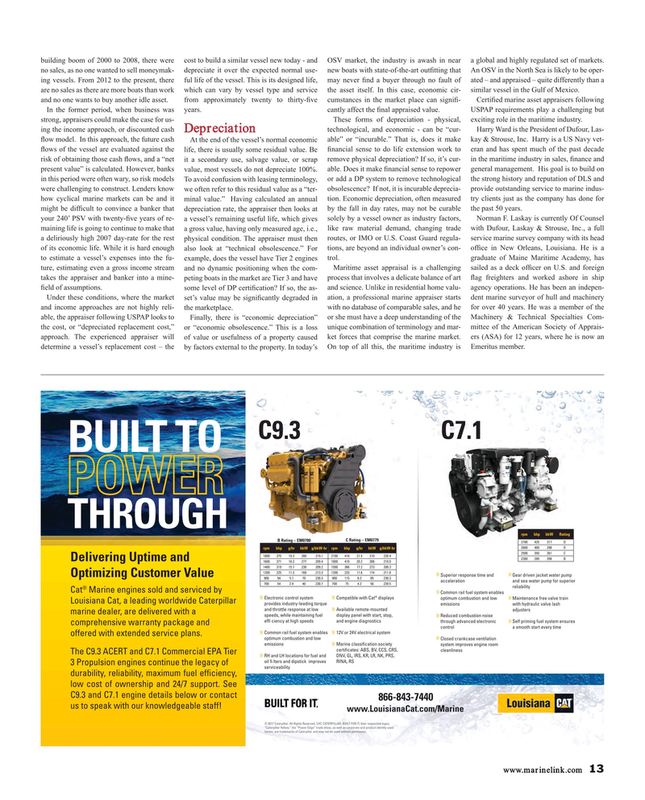 cantly degraded in ation, a professional marine appraiser starts dent marine surveyor of hull and machinery and income approaches are not highly reli- the marketplace. with no database of comparable sales, and he for over 40 years. He was a member of the able, the appraiser following USPAP looks to Finally, there is “economic depreciation” or she must have a deep understanding of the Machinery & Technical Specialties Com- the cost, or “depreciated replacement cost,” or “economic obsolescence.” This is a loss unique combination of terminology and mar- mittee of the American Society of Apprais- approach. The experienced appraiser will of value or usefulness of a property caused ket forces that comprise the marine market. ers (ASA) for 12 years, where he is now an determine a vessel’s replacement cost – the by factors external to the property. In today’s On top of all this, the maritime industry is Emeritus member. C9.3 and C7.1 engine details below or contact 866-843-7440 us to speak with our knowledgeable staff! www.LouisianaCat.com/Marine © 2017 Caterpillar. All Rights Reserved. CAT, CATERPILLAR, BUILT FOR IT, their respective logos, “Caterpillar Yellow,” the “Power Edge” trade dress, as well as corporate and product identity used herein, are trademarks of Caterpillar and may not be used without permission.